GAZA CITY, Gaza Strip (AP) — Israeli forces shot dead two Palestinians, including a 13-year-old boy, as thousands of people protested Friday along the fence dividing the Gaza Strip and Israel, Gaza’s Health Ministry said. The ministry said the boy was struck in the chest while the other, a 24-year-old man, was shot in the back. It added that 126 protesters were wounded by live fire. 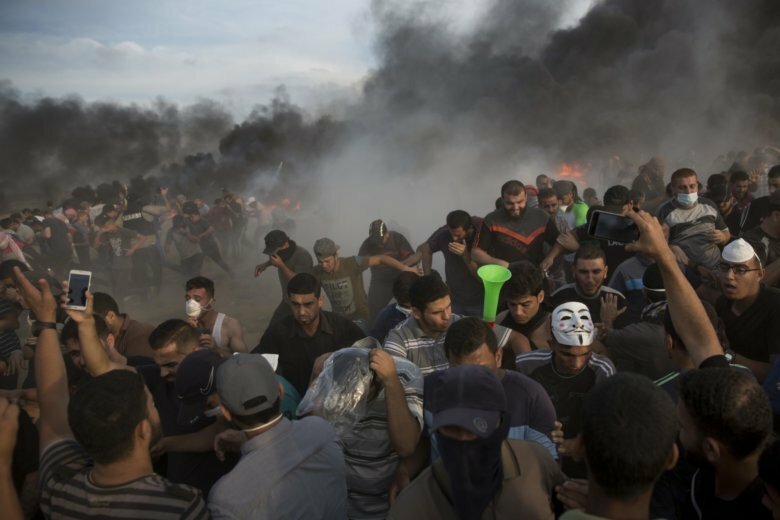 Responding to calls by Hamas, the Islamic militant group that rules Gaza, thousands of Palestinians thronged five areas along the fence, burning tires, throwing rocks and chanting slogans against a stifling Israeli-Egyptian blockade on the territory. The Israeli military said about 20,000 protesters participated. They threw explosive devices and grenades toward the troops which used tear gas and live fire to disperse the crowds, it added. At least at two locations, young men with bolt cutters tore the frontier fence but did not break into Israeli territory, according to the military. Israeli aircraft carried out two airstrikes in what the army said was a response to the firing of explosives. One strike hit less than 50 meters away from two clearly marked press cars belonging to The Associated Press. A cameraman said journalists, ambulances and vendors were in the area, about 250 meters away from the fence. There were no casualties. Hamas, which violently seized the territory from the Palestinian Authority in 2007 after winning legislative elections a year earlier, wants an end to the blockade that has shattered the economy and put the unemployment rate at more than 50 percent, plaguing most of Gaza’s 2 million residents. Hamas has initiated the protests in March on weekly basis, but escalted and intensified them recently after Egyptian-mediated efforts to broker a cease-fire deal easing the closure faltered. The number of participants was higher than last Friday, which, at seven deaths, was the deadliest in the last four months. While hundreds breached the fence last Friday, only dozens ventured to the fortified boundary today. Israeli fire has killed 147 Palestinians, including 33 children under the age of 18, since the protests began in March. In August, a Gaza sniper shot dead an Israeli soldier, prompting cross-border exchange of gun and rocket fire that fueled fears of a full-blown war. Khalil al-Hayya, a senior Hamas official who attended the rally in east Gaza, said his movement will not give up on lifting the blockade. “We don’t seek confrontations, but we want freedom,” he said. Hamas later issued a statement saying the Italian reporter who conducted the interview misrepresented herself and didn’t say she worked for Yedioth Ahronoth.